Celebrating its 40th year, SIGGRAPH 2013 invites you to showcase your expertise and unique technical and creative skills at the International Conference and Exhibition on Computer Graphics and Interactive Techniques, 21 - 25 July 2013 in Anaheim. 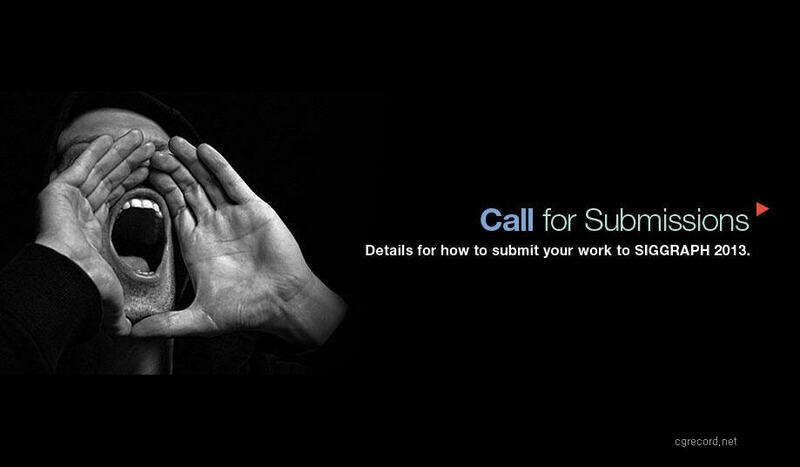 From students to studio executives, from scientists to artists, we invite you to submit your work for SIGGRAPH 2013. Calls for content submissions for most SIGGRAPH 2013 programs are available now on the SIGGRAPH 2013 website. Others will become available in the coming months. Every piece submitted to SIGGRAPH 2013 through the Call for Submissions will be reviewed by a highly qualified jury composed of top practitioners in the relevant field. Unlike recent years, each SIGGRAPH 2013 program has only one deadline, except Posters. There are no "Late Breaking" deadlines for Studio or Talks. Poster submissions can occur prior to the 12 February "General Submissions" deadline, or the 7 May Late Breaking Poster deadline. In both cases, Posters are reviewed using the same criteria and by the same jury. Authors submitting prior to the early deadline will get decision notification in mid-April. 5 March 2013 - Computer Animation Festival, Real-Time Live! *All deadlines are 22:00 UTC/GMT. For more information, including details on how to submit your content, visit the SIGGRAPH 2013 website.